I utkanten av Marrakech finner du Lalla Takerkoust-sjøen og Agafay-ørkenen. Hopp på en ATV og ri gjennom dette området, og utforsk det mangfoldige landskapet på denne halvdagstur. Passer forbi Berber landsbyer og ta utsikt over de snødekte Atlasfjellene. Plus, stopp for en kopp te på en lokal restaurant ved innsjøen. 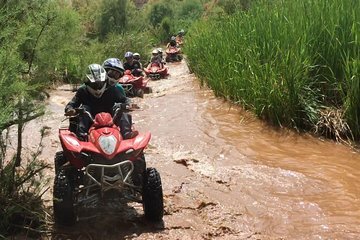 This excursion made it to the top of our list of things to do in Marrakech. Such a great experience. We were picked up from our hotel on time and taken to a nearby quad bike rent place. We were provided safety gear and was told how to use the bikes. All easy as fully automatic. Before venturing out towards Atlas mountains we were all riding (6 of us) in a line to make sure we were cofident on how to use the bikes. The ride through the mountains and Agafay desert was incredible. The views of the lake are a must see. We stopped half way through for mint tea and Morrocan pancake (all included in price). There were plenty of photo opportunities and the instructors didn't mind being our photographers. Overall great trip and a must do when in Marrakech!! !